The Graduate School for International Development and Cooperation (IDEC) in Hiroshima University started the i-ECBO Program upon the adoption of the 2005-2006 government-supported program on "Initiatives for Attractive Education in Graduate Schools". The i-ECBO is a program in which doctoral or master's students are sent to developing countries for a period of 1 to 3 months to undertake overseas internship under a pre-planned theme. This program also includes preparatory training, internship-related lectures and seminars and post-research activities. (3) Third country internship, in which students are sent to a foreign country to receive training based on Japan's experience and knowledge. The target participants of the program are not only students from IDEC but also students from other graduate schools in Hiroshima University. 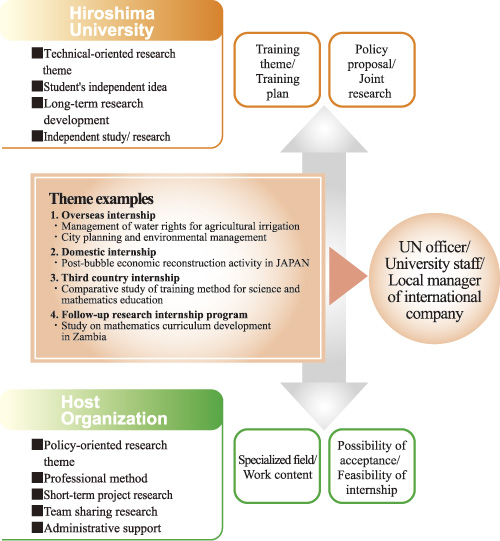 3) To establish a matching method between research themes created in the University and research theme needed in the company, institute or in other areas of internship. This program aims to promote the learning and training of students from all graduate schools in the university through global internship, to prepare them to become future leaders in the field of international cooperation.